Have you found yourself in situations where there are more photographers than there are artists at some public cultural events? Unfortunately, often these photographers are also a little aggressive and they seem to believe that their right to click pictures is more important than the right of the public to watch the cultural event. They want to be in the front to click their pictures and some times they are willing to fight with each other to get the pictures they want. If you think that I am exagerating, take a look at the picture below. Can you count the number of photographers surrounding the artists in this picture? And do you think that these photographers were really worrying about hundreds of spectators who had gathered in the city square to watch this cultural event? Recently, I found myself in the middle of a fight among people wishing to click photographs. Fortunately, I was not involved in the fight, and as soon as I could, I slipped away to a calmer place. But the episode made me think about what had happened, how the world of photography is changing and the feeling that over the next years, probably the things are only going to get worse. If we are organising a cultural event, I think that it is important to have clear rules so that photographers do not disturb the event. By photographers, I mean both - those with different kinds of digital cameras, as well as those with their smart phones. First let me tell you about the fight that I witnessed. It happened one evening in Schio (pronounced Skio), a tiny town at the foothills of Alps in north-eastern part of Italy, where I live. The cultural event was about the uniforms of the soldiers of Republic of Venice from 1797. It was almost near its end. I had found a place to stand in one corner of the square near the stairs of an underground parking. A guy with a nice SLR camera had taken position on the stairs, and set up his camera. For the finale of the event, they were going to fire the cannons. More people had joined us, including a lady clicking pictures with her smart phone, since we had a good view of the cannons. The lady with the smart phone kept on moving from one side to other, to click pictures from different angles. I saw the man with SLR camera standing on the stairs, moving left and right, trying to get a visual of the event and avoiding the lady. After about fifteen minutes, he could not control himself and spoke sharply, "You mind standing still instead of moving all the time and breaking my balls?" The lady turned towards him, initially shocked and a few moments later, indignant, "How dare you speak to me like that? Behave yourself." I think that the guy realized that he had crossed a line and had been too rude, but for some time he continued to bluster, while the woman raised her voice and soon her husband, who was standing some distance away, came and joined her. For a moment, I thought that they were going to punch each other, but somehow common sense prevailed and the SLR camera guy backtracked, while the woman moved away. After another 5 minutes, a couple of men with their smart phones, busy clicking a video, came and took the place vacated by the woman, standing in front of the camera guy. Disgusted, the guy snorted, put away his camera in his bag, left his place on the stairs and moved to an empty area of the square, which did not have a good visual of the event. After the event, I kept on thinking about the photographers at the event. I was also there with my camera, though I am quite laid back about clicking pictures. If I get the opportunity I am happy to click but if people come and stand in front of me, I usually wait for them to move or change place. That evening there were hundreds of persons who took pictures. Perhaps, 20% had digital cameras. The other 80% had their smart phones. That evening I was asking myself, if we going towards wars among the photographers? I think that photography in public cultural events has become a serious issue that requires the setting up of some clear rules. In the cities of developed countries of Europe and US, and even in the big cities of less developed countries, the number of people with big SLR cameras and all other kinds of digital cameras is increasing every year. Whenever there is a public cultural event, it becomes a free for all among all the photographers to get good pictures, close ups and innovative angles. Some photographers block the visual of people who have come to watch the performance, standing there in the front as if they are transparent or if they have a special right to go and do as they wish. I am not including "official photographers" in this list, including videographers, who also block the visuals but at least they do it because they are being paid to do it. In fact official photographers are often in the middle of the performances, moving around, not really bothering about the public. If the epidemic of different digital cameras was not enough, the proliferation of good cameras in the smart phones and the possibility of sharing "See, I am here" kind of pictures on Twitter, Facebook and Instagram, has added another layer of chaos to the discourse. Now it is not enough to worry about those with digital cameras blocking you, there are literally hundreds more with their smart phones who also want to click pictures. If they have a family member or a friend who is performing in the event, they become impossible to control, jumping around in front, and refusing to move from their places, ready to fight for it if needed. It seems that the trend of taking pictures and videos and sharing them with our friends and others, is going to spread and get bigger over the coming years. Thus, I think that photography related conflicts are going to become more common. The good manners' guides do not tell us how to behave in so many situations in today's world like for the use of our mobile phones and cameras, but if we want to avoid conflicts, we need to define new rules that respect common codes of decency and privacy in public spaces. Fortunately, lately my interest in photography is on the wane. I had my first digital camera in 2005. For many years I have suffered from clickitis, defined as the irresistible urge to click pictures. I was always looking for opportunities to click pictures. I had my photoblog Chayachitrakar where I posted new pictures every day. It has more than 2000 posts. Then something changed inside me during 2015 - suddenly I was no longer so compulsive about clicking pictures. In January 2016, I also stopped adding pictures on my photo-blog. Lately I have even been to some cultural events without my camera. I still take a lot of pictures, but if I can't, it is not such a big deal. Perhaps it is because of this change in my attitude that I can now talk of making of rules to regulate photography. 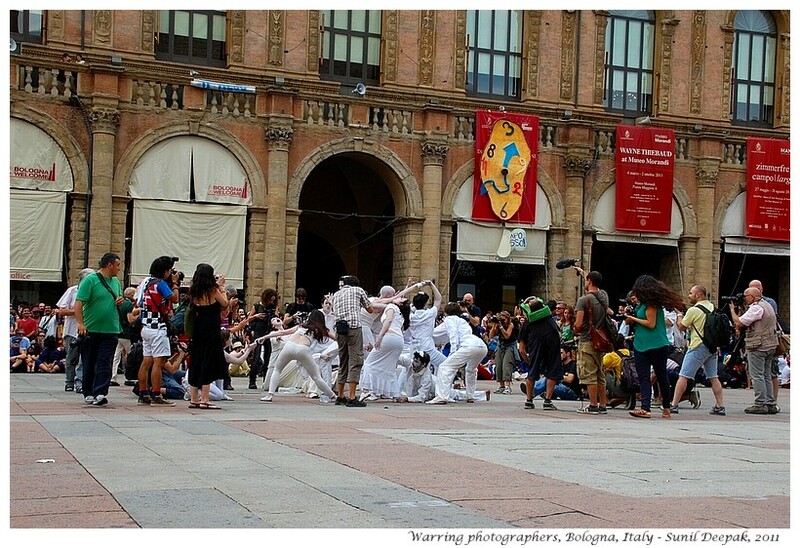 What do you feel - do you think that photographers are becoming a nuisance at public cultural events? Agree with you completely.A very topical and relevant post! Thanks Rajeev for the comment and also for agreeing with me.